Further punitive restrictions on Universal Credit are on the way. The latest development of Ian Duncan Smith’s Universal Credit scheme will soon mean that people made unemployed will have to wait at least five weeks before getting any financial support. At present it’s two weeks; still a long time to wait when you have bills to pay and mouths to feed. Some of this is administrative delay, but with the new five week wait it will be a deliberate strategy to force people into immediate work or push them into penury – the latter being more likely in an economy where jobs increasingly can’t actually fund even basic necessities like housing and energy costs. That’s why the TUC have launched a campaign to ‘Stop the Five Week Wait’ as part of their Saving Our Safety Net project, launching a petition against IDS’ impoverishment strategy. It poses a very clear question: how long could you go without any income? Even for those in work, many have to scrape together money from friends and family at the end of the month in what some call ‘scrounge week’. Imagine that week becoming five. Why so long? A whole calendar month will be spent ‘assessing’ the amount of benefit you’ll be able to receive. Then you’ll have to wait a week for the DWP to actually arrange your payment. But you’ll also have a week-long period when you will be unable to even apply for Universal Credit. The government is deciding whether this will be during the assessment period or beforehand, meaning potentially sixweeks in assessment, admin and spiteful restrictions. And this from a government that supposedly hates bureaucracy and red tape. There will be some emergency support available. But the rules on who can claim it will be so strict that very few able to claim Universal Credit will be eligible. Richard Exell at the TUC writes that “one reason for being turned down, for instance, will be that your family has debts that might make it hard for you to repay the advance.” Unbelievable. The public are against it, understandably – by 70 per cent to 18 per cent when told about the policy. Even the vast majority of UKIP and Conservative voters oppose the wait. But there’s a problem: just 13 per cent have actually heard of it. We need, therefore, to spread the word fast if there’s to be any chance of stopping this disastrous scheme going under wraps. The policy can be summarised quite simply: the state safety net being outsourced to food banks and payday loan sharks. This is a government hand-out to Wonga and co, while returning to the Victorian welfare state of unreliable charity. TUC general secretary Frances O’Grady has branded it ‘cruel and vindictive’. It comes in next April – just a month before the General Election. With a strong enough campaign, it can be halted or pushed beyond that date. So there is an opportunity for the opposition to succeed. Millions of people who might be made redundant over the coming years are relying on that outcome. You can read the TUC’s report on the five week wait, Universal Credit: Solving the problem of delay in benefit payments, here. enlisted from Victorian era where the poor were thrown in jails because they were homeless. IDS, has the mentality of the Victorian workhouse owner – work them till they drop. I think in order to prove the thinking, that IDS should himself live without an income or bank account, in rented accommodation to witness and understand the issues of poverty. This man and his ideas go beyond the pales of cost effectiveness, they are cruel and unnecessary. Claw back money from the likes of Vodafone,Starbucks, o2, and your paymaster Philip Green, Mr Duncan-Smith, that surely is fairer and more balanced method of raising money in a civilized society! It takes about a month to starve to death, probably quicker for a man with muscle tone or a lady grown rounded by the cheap food that is just bulk. So this is starvation by design that was the New Poor Law of the Victorian era enacted by the Tories and Liberals (now called Lib Dems), bearing in mind without benefit you cannot access food vouchers to a food bank. But a food bank is only 3 vouchers in a year, even on benefit. Foreign news services tell that starvation has increased around 70 per cent since 2010. And doctors through their medical journal, The Lancet, have been saying that there has been a big increase in malnutrition admissions to NHS hospitals. not to Fareshare, the supplier of food banks. to cover basic needs, non-withdrawable, in or out of work. – 50 per cent increase for current receivers of state pension and pensioner benefits. These manifesto pledges together would end starvation for all for good. that would make it all but impossible for Tory opposition to a just and fair society. Hey Ids’ biggest fan it was not just Victorian times they threw the poor in jail.They put the homeless in jails when the London Olympics were on,I think Herr IDS is trying to break the unemployed and see how far they can take it. Over in Ireland they take care of the unemployed properly they get double the amount of money per week that the English get and they don’t even hassle you because they know the job prospects are totally bleak but at least they give you enough money to live on. So they want you not to see a penny before the interview, and then have a week AFTER that with no pay? 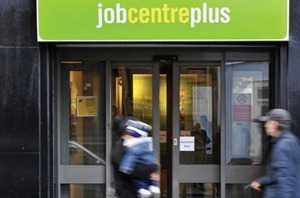 When UC’s rules mean that because of in-work conditionality, millions more will be attending jobcenters. Six weeks is generous…could well be more. Not even close, afaik, even for Universal Credit. Seen the rules for in-work conditionality? The in-work conditionality is worse, but you can’t get the media to take it seriously because they see social security purely as human interest bullcrap, the journalistic equivalent of a ‘soft’ subject. They never require a human interest example of an affected household when the topic is civil liberties or immigration- they can be included but are not mandatory unlike with benefits policy. Tied in with this is the unprecedented amount of power Smith gave to his Secretary of State portfolio; repeated uses of ‘as the Secretary of State sees fit’ in the 2012 Welfare Reform Act turn conditionality into no longer being a matter of law and statutory entitlement but of the whims of who ever is in charge of the DWP. Whether you are in work or not- I don’t think any other ministerial position gives such vast control over the lives of so many. 5 years younger then him, he has been told that he will not get the payout of his state pension til he is 73. So much of the state pension small print gives people NIL or far less than the already lowest state pension of all rich nations bar poor Mexico, that the flat rate is more about withering away or abolishing the state pension. Labour is targetting Nick Clegg’s Sheffield seat. If Labour did a u-turn and put in Labour’s 2015 manifesto repealing the Coalition’s Pension Bills 2010-2014 (includes the flat rate pension 2016 brought in by Pension Bill 2014) and paid out the state pension denied women from 2013 and equalised the state pension for men at 60 in 2015, then Labour would get a majority government and win Sheffield with a landslide victory. Because it costs nothing to pay out the state pension, as it sits unused and unable to be spent on anything else since 2013 in the National Insurance Fund and wrong called a surplus by the Coalition and an old Labour member, John Prescott, who has been too long out of government and has forgotten that the NI Fund is the source of the state pension. I know this is old but they told me about it at my interview. Yes, even murderers and rapists get shelter and 3 meals a day. What example does that set? I might emigrate to Ireland to be sure. They won’t have enough prison space to jail all of us. And they give you a 75% of €188 Xmas bonus the first week in Dec.. €188 is the flat rate dole per week for a single adult over 24! !